In the wake of its war with Georgia, Russia (as represented by Medvedev, Putin, and the Russian foreign ministry) has repeatedly made noises about wanting nothing but friendship and partnership with the West, including the United States, and having no interest in a "new Cold War." 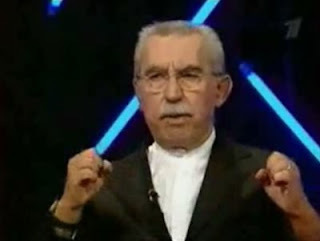 In light of these protestations, it's interesting to note that on September 12, Russia's state-owned Channel One broadcast the "documentary" Zero by Italian journalist Giulietto Chiesa (who served as the Moscow correspondent for the Italian Communist newspaper Unita in the 1970s) and leading French 9/11 conspirologist Thierry Meyssan, which advances the idea that the World Trade Center bombing was an inside job and that no plane ever hit the Pentagon. The broadcast, in the prime-time program ironically titled "Closed Screening," went largely unnoticed in the West except by 9/11 "truther" sites. The showing of the film was followed by a panel discussion before a live studio audience (which included both Chiesa, who speaks Russian, and Meyssan). The host, Alexander Gordon, made no secret of his sympathy for Chiesa's viewpoint, though he politely noted that the documentary could have used more objectivity. 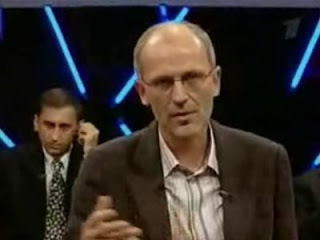 Several other pro-"truther" panelists, including the rabidly anti-American TV host Mikhail Leontiev, spoke at length in praise of the film, complimenting its makers on their courage and insight, ridiculing the official version of the attacks as absurd (in Leontiev's words, "the ravings of a gray mare" -- a Russian colloquialism that means something like "total nonsense"). TV anchor Alexei Pushkov categorically asserted that while we cannot be sure who engineered the attacks, the idea of "19 Arabs directed by Osama bin Laden in a cave" is completely discredited. He and co-panelist Geidar Jemal, the chairman of Russia's Islamic Committee, also lamented "the death of information" in the Western media and its replacement by "manipulation" -- thankfully, with heroes like Chiesa and Meyssan on hand to resist it. Toward the end of the discussion, explicit parallels were drawn between the Western media's obedient parroting of official lies about 9/11 and their collusion in the "official version" of the Russia/Georgia war. A couple of guests briefly and sheepishly offered opposing viewpoints. Irina Zvyagelskaya, analyst at the Institute of Oriental Studies in Moscow, said that she was "unconvinced" by the film and added that if its premise was true and such a cynical act not only toward one's own citizens but also toward world opinion could have been perpetrated, "you don't want to live in this world." Gordon then sarcastically suggested that, in order to be able to go on living, she was going to "shut out" inconvenient truths such as Chiesa's film (to which Zvyagelskaya replied that she would question all versions). TV journalist Vladimir Sukhoi, former Channel One Bureau chief in the US, said -- looking visibly nervous -- that a good journalist should not pursue an agenda or "string facts onto the skewer of his theory," and criticized Chiesa for doing exactly that. His comment went unanswered. When Gordon turned to the studio audience and asked those who believed in the official "19 Arabs" version of 9/11 to raise their hands, not one hand went up. Toward the end, Meyssan launched into an impassioned diatribe against brutal U.S. dominance all over the world and noted that Russia, no longer weak as in 2001, was the world's last, best hope. "Who can stop this huge predator which is ravaging the planet? We expect a great deal from you, from Russia. Only you can stop all this!" he exclaimed, to raucous audience applause. Ironically, on the same day, at a three-hour meeting with the Valdai Club mostly made up of Western political experts, Russian President (or is it Puppet-in-Chief?) Dmitry Medvedev declared Georgia's military action against South Ossetia on August 8 to be Russia's 9/11. The similarity, apparently, is that "Russian citizens" (i.e. South Ossetians to whom Russia started issuing Russian passports a few years ago while still formally recognizing South Ossetia as Georgian territory) were attacked on August 8 just as U.S. citizens were on 9/11. On the website Grani.ru, commentator Andrei Piontkovsky caustically noted that when Russian state TV embraces the notion that 9/11 was cooked up by U.S. imperialists as a pretext for war, "our 9/11" sounds "rather ambiguous" coming from the President of Russia. That aside, Condoleezza Rice might want to bring up this disgraceful broadcast -- clearly meant to fan the flames of anti-Americanism in the Russian public -- next time she has a chat with Russian Foreign Minister Sergei Lavrov. Unsurprising given Russia's hand in 9/11. According to Litvinenko, the FSB trained Ayman al-Zawahiri right before he joined up with bin Laden and created the al-Qaeda we know and love today. 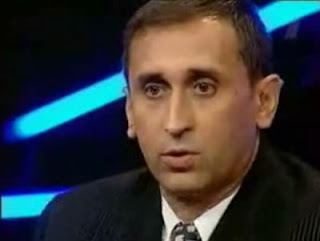 He was in Dagestan in the late '90s, ostensibly in jail while the Russians haplessly tried to figure out who he was. Odd – though he was one of the most well-known and widely photographed Islamic terrorists in the world, and though the Russians have a first rate secret service, and though the conditions under which he was traveling through the Northern Caucasus were extremely shady, the Russians never managed to figure out who he was! Or...it was all a cover. I'm guessing it's the latter. Interesting info! but I'd be a little (or more than a little) leery to jump to conclusions about "Russia's hand in 9/11" on the basis of this. Ms. Young - I recommend doing some serious research into the events of 9/11/01 before embarrassing yourself further. Start by going to patriotsquestion911.com, ae911truth.org and stj911.org, you may also want to read some of Dr. David Ray Griffin's excellent books on the subject. The 9/11 truth movement is a global movement made up of people from all walks of life and adhering to a variety of political and economic philosophies. I fully agree with John's comment. And to prove his point, I should weigh in and and say I am a staunch defender of liberty and the Western tradition, and that I've liked a lot of what you, Cathy Young, have had to say in your career up until today. But I am very sorely disappointed by your hit-piece style of commentary here. Rock-solid reasoning and research concerning the events of that terrible day you casually brush aside with the flimsiest innuendo, with no attempt to shed light on the controversy as a whole or even the narrower point of what was covered in the presentation. I consider your blog entry here to be resoundingly unacceptable. You do the same dysfunctional thing that all of the debunkers do: 1) you refuse to challenge the Truth movement on any of the real issues regarding 9-11, 2) you selectively dance around the evidence that you refuse to confront, and 3) you touch on unrelated random points with an air of dismissive authority. Your arguments are pitifully weak and you seem to know it. You know you can't confront the evidence head-on, so you settle for scaring away other people who may be newcomers to the 9-11 issue...newcomers such as the Stepford zombies who read the Weekly Standard. I was reading and enjoying Reason magazine (your best-known employer) for a very long time, since before you were a teenager. I very much liked some of your own writings from the past. But it all makes me very sad now, because I realize you are not a journalist at all, but a two-bit shill. Many things I can learn from your blog, it's really wonderful and meaningful, I like reading it very much. Recently, I always want to buy some chic mercer ralph lauren shirts, I think they are very cool. And I think you also need a pair of promotional ralph lauren shirt. They can make you become the attactive person. Are you still wearing those dull clothes? why do you try classic polo shirt? Do you want to be a fashion chaser? Follow me and you can chase the most popular white polo shirt. it can help you increase your fashion taste, you will be the focus wherever you go only if you wear polo clothing. At the same time, I am always wanting to buy perfect prince tennis rackets, and I find many places, where sells perfect tennis racket. In order to play the game and search the place where can buy the head tennis racket, and finally, I find thistennis shop. You can buy what you want in this store online. the Russians have a first rate secret service, and though the conditions under which he was traveling through the Northern Caucasus were extremely shady, the Russians never managed to figure out who he was! Or...it was all a cover. I'm guessing it's the latter. Rock-solid reasoning and research concerning the events of that terrible day you casually brush aside with the flimsiest innuendo, with no attempt to shed light on the controversy as a whole or even the narrower point of what was covered in the presentation. This essay help means a lot of me! Thanks for post! is to encourage lenders to chi flat ironsmake sure to accept the plan. Lenders will be less security in accordance with the Paulson plan because it is not guaranteed. FYI, I passed this along to my commrades at TucsonPrinting.net. I'm sure they'll chime in with $.02 at some point. Excellent is the only word i can give u for this wonderful blog, keep it up. Bonus Bwin I will come back again to read some more interesting things on this topic. There are still many conspiracies with the issue of 9/11 attack. Thanks for sharing this one to us. Your air nike max 90 persists to be to turn out to be critically selected precise now with many different modern color ways. It is only a an amazing performance runners. Thanks for the post. It is a very informative and useful post. These kind of post are always inspiring and I prefer to read quality content. Thanks for sharing. Great websites! Who's afraid of Sarah Palin?